For my latest updates, follow me on Twitter! 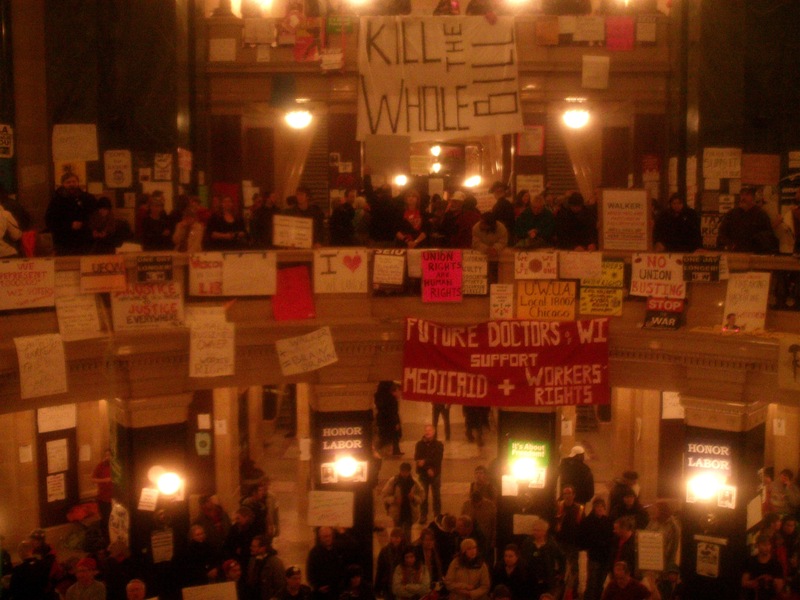 February 25, 2011: Walking into the occupied State Capitol of Wisconsin was more than mind blowing. I had imagined a small group of folks holding space in one area, confined by police lines. And from what the news has been reporting, things were starting to die down here. What I saw was quite different. Right inside the door, a huge poster hangs. “IN THE EVENT OF A GENERAL STRIKE, I VOW TO SUPPORT WORKERS”, it reads, and hundreds of signatures have been scribbled beneath. The entire 4 or 5 story building is nearly completely occupied by union members, students, and people from across Wisconsin. There were literally hundreds of people here last night, and one or two hundred this morning that, like me, slept on the cold floor or on mats they had brought in. The Capitol is covered in posters and signs reading things like “Hands Off Workers, Make the Banks Pay”, “Scott Walker is Robin Hood in Reverse”, and “Our Prayers to Libya – Power to the People”. A gigantic “Tax the Rich” banner hangs over the railing on one of the third floor walkway. In the atrium at the center of the building, beneath a giant dome that peaks above Madison, an impromptu, all-day open-mic is hosted. Speakers announce their union or school, or where they came from. Drummers bang beats to massive chants that erupt every few minutes. “Beat The Bill!” the crowd says over and over, causing echoes throughout the space. Firefighters, construction workers, steamfitters, cleaners, state workers, high school students, veterans, and police officers stood side by side in opposition to the Tea Party-backed Governor’s crazed anti-Union legislation being discussed around the corner. Dotted among them were a few non-locals like myself, some who came from as far as Los Angeles to show support. When non-locals announced their presence, huge cheers erupted and people came to them to thank them. As I told the crowd when I spoke, this is a national issue. What happens here effects us all. And besides, Governor Walker’s campaign was funded nationally, with much money coming from Tea Party-backing billionaire David Koch. So why can I not stand my ground here too? This speech brought a massive wave of energy and cheering from the crowd. With the support of the police union, few here seem to feel any sort of fear of getting arrested, hurt, or intimidated by them. And one can only assume the fear this has created inside the State government. The atrium is surrounded by banners and posters from all over, showing the massive convergence of different groups who have come together inside to fight the anti-Union legislation of Governor Walker. On the second floor, along with many sleeping areas, there’s a medic station, a free food area, a child care space, a computer/phone charging station, an info desk, and other resource area that are setup and staffed full-time. Coffee, tea, and snacks are always available, and every few hours someone walks in with a gigantic load of pizza. Above them, a third floor hosts sleeping areas and several spots where cameras are posted up. Four large-screen televisions have been setup to show footage of the House meetings that ended last night in an uproar. As the night grew, people sang songs to each other, networked, and talked politics. One girl sitting near me was doing her math homework, sleeping at the occupied Capitol and going to class in the morning. After hours of highly energetic community, the crowd quieted down to focus on the debate. For hours, Democratic lawmakers, in rare fashion for American politicians, angrily condemned the Republicans in the House for even proposing such a bill. Tears and yelling from lawmakers themselves and several outbursts from the crowd that disrupted the meetings coated the debate with the intense reality of the legislation they were pushing through. At 2:00 in the morning, as many slept, the final decision was made. After the final speaker, the vote was announced faster than many could follow it. The House passed it, and the crowd began a booing. One lawmaker threw his pro-Union shirt, which all those Democrats who opposed the bill had worn during the debate, to the crowd. He stood waving his fist to the crowd. Another stood before the crowd to thank them for their presence. She had made a passionate speech inside the debates that had brought massive cheers from the crowd. The night ended with an intense round of impromptu speeches by students, union members, and two House delegates who had fought the bill. “We are not going anywhere”, one said. The 97-union South Central Federation of Labor of Wisconsin voted late last week to begin plans for a general strike in the event that the bill is ratified. It still must pass through Senate and be signed by Governor Scott Walker. And the “Fab 14”, Democratic Senators who are staying in Illinois to delay the vote, have still not returned. I’ve never seen anything like this! There is a very literal solidarity between workers and students who are tirelessly fighting this and democratic lawmakers who are actually sticking their necks out, takings risks, and making bold moves to defend the people. Thanks for the update brother. We are all in this together in solidarity. You have the support of many troops, like myself, all the way from Afghanistan. Thanks for the updates brother, as you already know Bmore stands with you in solidarity with the people speaking truth to power in Wisconsin!